A veteran Russian Cosmonaut and two NASA Astronauts with prior Space Shuttle experience blasted off from Kazakhstan’s Baikonur Cosmodrome Wednesday night on a planned 160-day space flight to the International Space Station. Painting a trail into a mostly clear night over the remote launch site, the trusted Soyuz rocket provided a flawless ride to the three crewmen heading off on a two-day chase of the orbiting laboratory for arrival on Friday to join the Expedition 55 crew for a busy mission focused on ground-breaking science. Second-time Soyuz flier Oleg Artemyev, Hubble repairman Drew Feustel and Educator Astronaut Ricky Arnold climbed into their seats atop nearly 300 tonnes of explosive rocket propellant after the sun had set over the historic Baikonur launch pad – the site of the world’s first human space flight nearly six decades ago and the departure ramp for most International Space Station crews. 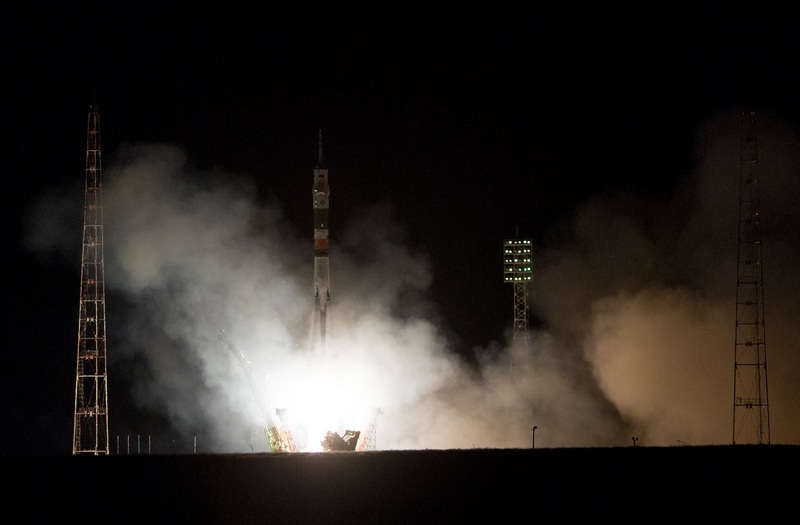 Their Soyuz FG rocket, the 63rd of this particular make of Soyuz, came to life at 17:44 UTC, 11:44 p.m. local time to blast into the night on a nine-minute ride into Low Earth Orbit. Arcing into only a few patchy clouds over Baikonur, Soyuz MS-08 and its crew raced off on a 23-week flight. Soyuz dropped its four boosters two minutes after launch when passing 50 Kilometers in altitude and the large Core Stage handed over to the third stage before the mission hit the five-minute mark for the final push to orbital velocity. The raw power of rocket motors transitioned to the sensation of zero-gravity in an instant as the third stage’s engine cut out eight minutes and 45 seconds into the flight, marking the crew’s safe arrival in orbit. Circling the Earth at an altitude of 200 Kilometers, Soyuz will be tasked with ascending to the Space Station’s 400-Kilometer orbit over the next two days for a fully automated link-up. 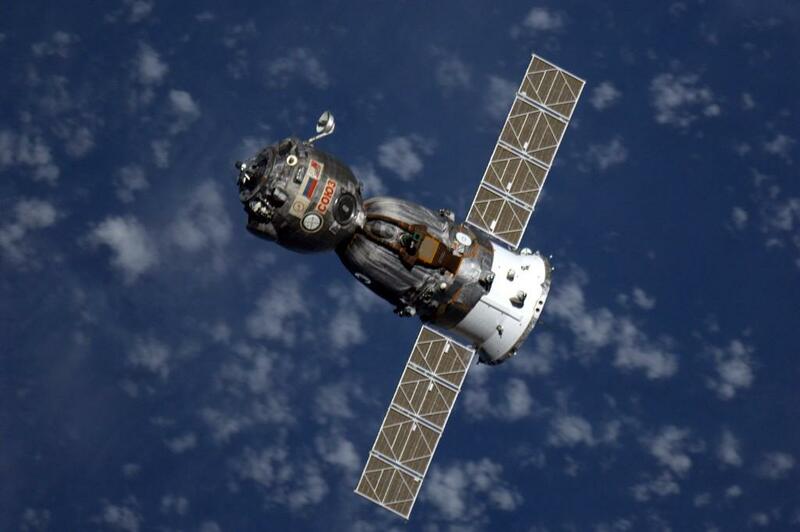 If all goes well, Soyuz will arrive on the Station’s doorstep on Friday for a planned 19:41 UTC docking to the space-facing Poisk port to deliver the second half of the Expedition 55 crew to their out-of-this-world home and workplace for the spring and summer. Wednesday’s launch was the 26th orbital space launch of the current calendar year and the first crewed launch of 2018. Three more crewed flights of Russia’s Soyuz rocket are on the schedule for 2018 in addition to the uncrewed and crewed test flights of Boeing’s Starliner and SpaceX’s Dragon spacecraft, though expectations are that one or both crewed missions will not launch until 2019 based on internal ISS planning schedules. The launch of the 137th Soyuz mission sets the stage for a very busy period aboard the International Space Station. In addition to a packed science program with over 300 experiments, the Expedition 55/56 crew will oversee up to six visiting vehicle arrivals and support a series of spacewalks on both sides of the Space Station including work to ready the communications infrastructure outside the complex for the start of Commercial Crew missions. Though the majority of the crew’s time in orbit will be focused on scientific experiments after ISS was able to step up to regularly completing 80 to 100 crew hours of science per week on the U.S. 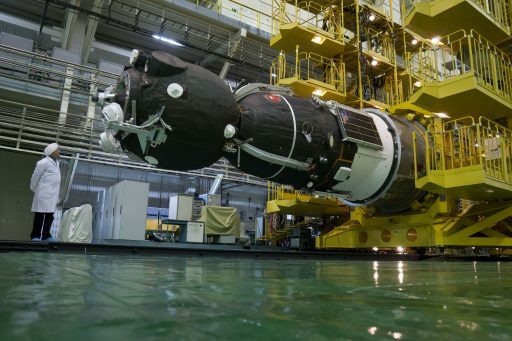 Segment, enabled by the increase to four crew members after Russia decided to reduce its crew while waiting for the launch of the Nauka laboratory module. 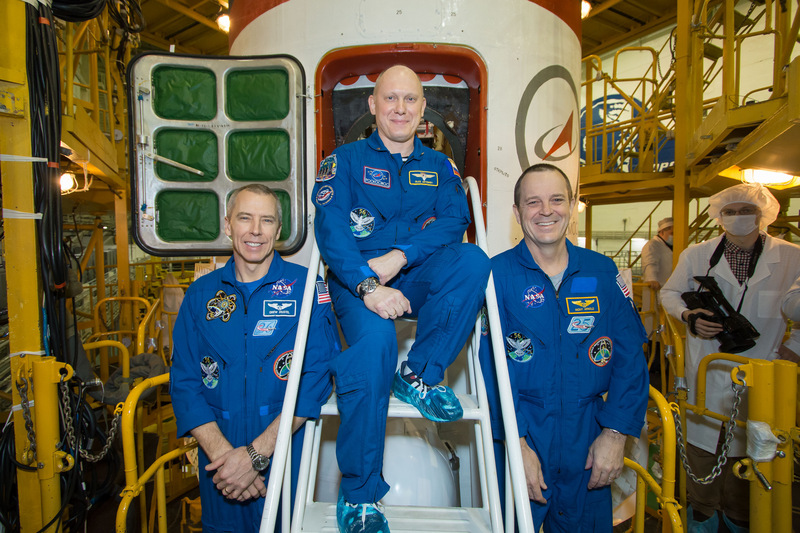 The crew of Soyuz MS-08 was assigned by late April 2017, less than one year before launch. Their launch date bounced several times between March 9th and 15th before eventually settling for the 21st under the overall scheduling of ISS events – requiring the mission to revert to the conventional two-day rendezvous as the orbital setup for the faster six-hour flight scheme requires months of orbit tweaking by the Space Station. 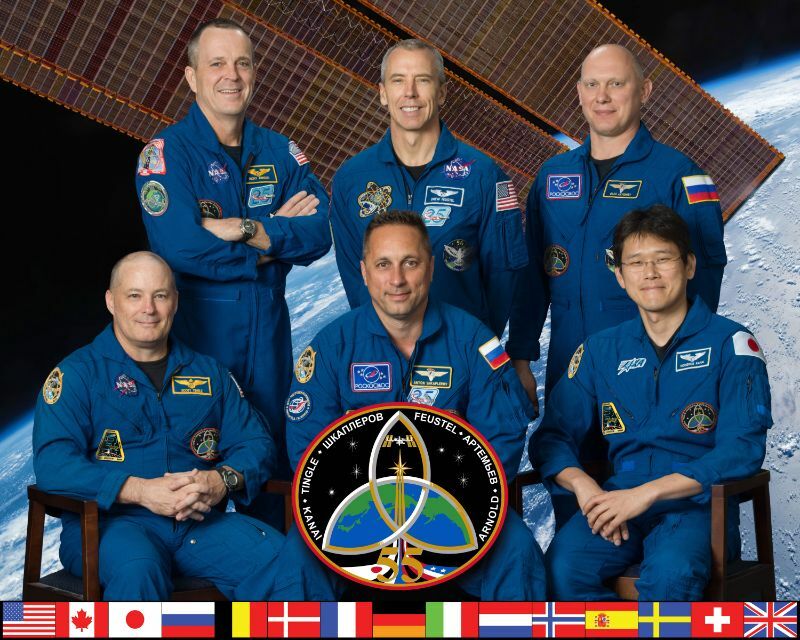 Soyuz MS-08, flying under the call sign Hawaii, is Oleg Artemyev’s first flight as Commander after he served as a Flight Engineer on Soyuz TMA-12M and ISS Expedition 39/40 in 2014, logging 169 days off the planet. His background is in aerospace engineering, having worked for Russian spacecraft builder RSC Energia from 1998, including several Soyuz launch processing campaigns at the Baikonur Cosmodrome that sent crews on their way toward ISS. Artemyev was initially cleared for spaceflight training in 2000 but was only selected in May 2003 to begin basic training and evaluations. After receiving his Cosmonaut certification, Artemyev continued working within Soyuz and ISS pre-launch processing, EVA hardware evaluation and he participated in the first two stages of the Mars 500 isolation experiment in 2007 and 2008. As part of his first space flight, Artemyev conducted two spacewalks for a total of 12 and a half hours. 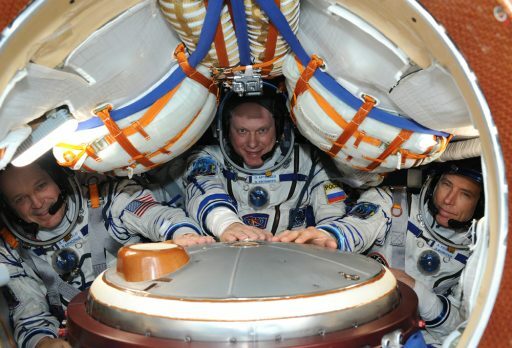 Certainly no stranger to spacewalking is NASA’s Drew Feustel, embarking on his first long-duration mission aboard Soyuz MS-08 after accumulating 28 days in orbit on a pair of Space Shuttle Missions. After earning a PhD in Geological Sciences and five years working in industry, Feustel was selected by NASA in 2000 and flew for the first time on one of the most high-profile missions of the current century – the final servicing mission to the Hubble Space Telescope in 2009. On his two flights, the second being the final voyage of Shuttle Endeavour, Feustel performed six EVAs for a total of over 42 hours, placing him in the Top 20 on the all-time list. 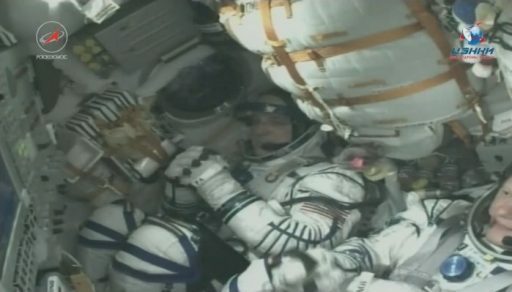 Rounding out the Soyuz MS-08 crew is NASA Astronaut Ricky Arnold, also starting his first long-duration stint in space. A trained Marine Scientist, Arnold started a career in teaching in 1993 – working at various American International Schools around the globe before NASA selected him as an Educator Mission Specialist in 2004. Arnold logged 202 orbits aboard Space Shuttle Discovery and the International Space Station as part of the STS-119 mission in 2009 that delivered the final truss segment and solar array wing to ISS. With a liftoff time near midnight, the crew trio started their final launch preparations after waking up from a mid-day nap to rest up for a long night of activities. After a final shower in the comforts of gravity and dinner at the Cosmonaut Hotel, the crew participated in the commemorative signing of their hotel room doors before receiving their pre-flight blessing and being sent off by a crowd of Cosmodrome employees and families. 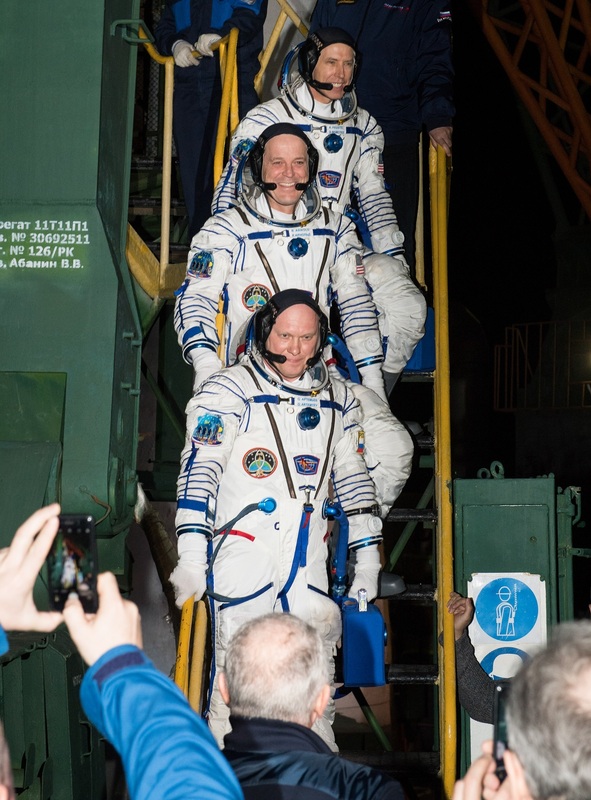 At Site 254 of the Cosmodrome, the crew donned their Sokol Launch and Entry Suits and went through leak checks before departing for Site 1/5 – the primary on-ramp to space for crewed missions from Baikonur since Gagarin’s milestone flight in 1961. Out at the storied launch site, Soyuz had been undergoing detailed checkouts since Monday morning’s rollout, pressing into a final set of preparations for the nighttime blastoff at T-8 hours. 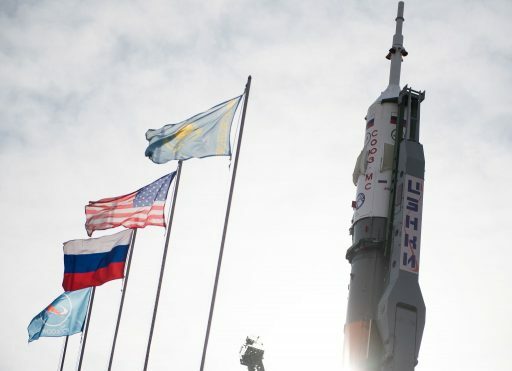 Russia’s State Commission gave the formal approval for propellant loading and the two-hour procedure went in motion at the T-5-hour mark as 274,140 Kilograms of Liquid Oxygen and Kerosene were to be loaded into 12 separate tanks on the launcher. Soyuz also received Liquid Nitrogen to act as pressurization gas during flight and engineers filled the boosters and Core Stage with Hydrogen Peroxide to drive the turbomachinery of the engines. 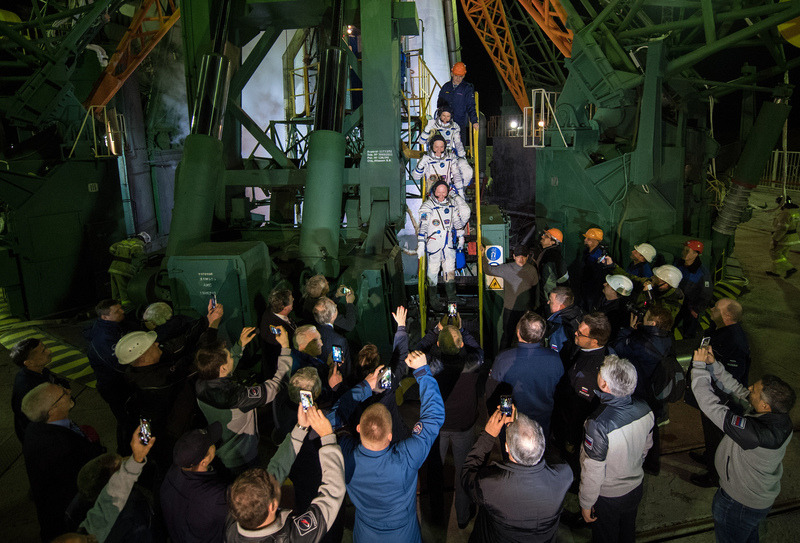 The crew’s bus pulled into the Dangerous Zone around their venting Soyuz rocket two and a half hours before launch, giving the crew their first and only chance to see their fully assembled Soyuz rocket before taking their seats inside the small Entry Module of the MS-08 spacecraft. Sealed off from the outside world, the crew put their spacecraft through a set of leak checks as they worked through an hour-long checklist before being entertained with music to make the wait for liftoff a bit shorter. 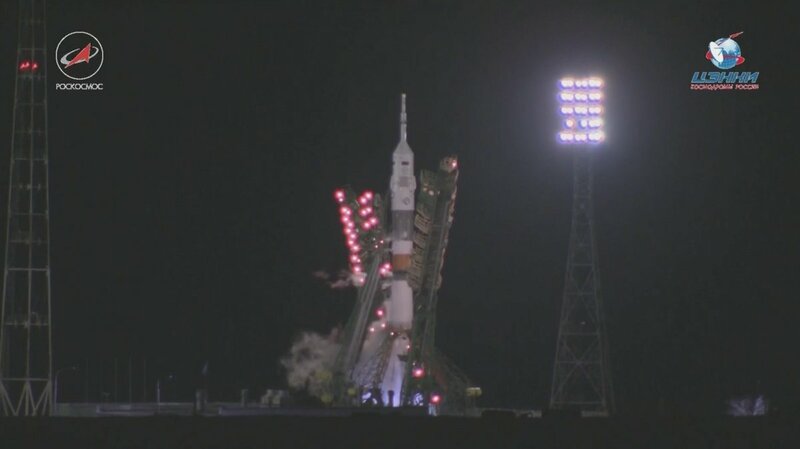 The 49.5-meter tall rocket was revealed atop its pad at T-45 minutes when the Service Structure was lowered to its launch position, leaving Soyuz standing under illumination by floodlights as all personnel departed the complex. Operations were handed over to computers as the Launch Key – a relic of Soyuz’s ICBM roots – was inserted by officials inside the Launch Bunker at T-6 minutes. Moving through a carefully choreographed series of steps, Soyuz began pressurizing its tanks and was given full control at the one-minute mark as the first of two umbilical masts retracted from the rocket. “Pusk” was the call from the Launch Team to acknowledge the Launch Command had been issued at T-20 seconds – sending the four boosters and massive core stage into their ignition sequence to first spin up their turbopumps and reach a preliminary thrust stage before ramping up the RD-107A and RD-108A engines to a collective launch thrust of over 420 metric ton-force. 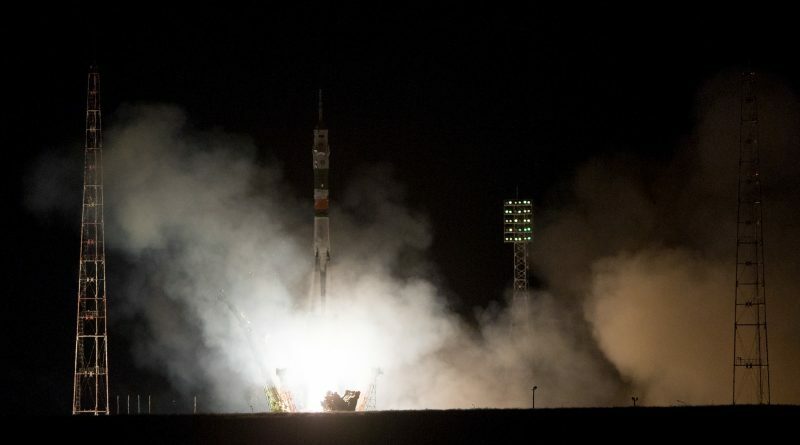 Overcoming counterweights, the 305-metric-ton Soyuz took flight at precisely 17:44:23.396 UTC, rising vertically from the launch table and lighting up the surrounding areas of the Cosmodrome where many had gathered for the late night launch. Balancing on a pillar of flames, Soyuz ascended vertically for fifteen seconds before its analog guidance system sent the vehicle into its pitch maneuver to begin heading north-east toward the Russian-Kazakh border to dispatch its 7,200-Kilogram payload into the orbital plane of the International Space Station. Conducting its 1,886th mission on Wednesday, Russia’s Soyuz rocket – despite dealing with its own reliability struggles in recent years – remains unmatched in the world of rocketry, both for heritage and reliability over a period of decades. Finding its roots at the dawn of the space age, Soyuz to this day uses the R7 architecture envisioned by Sergei Korolev while the Soyuz spacecraft, although flying with modernized systems, has also been using the same overall architecture for decades – betting on tried technology to safely ferry crews between ISS and Earth. 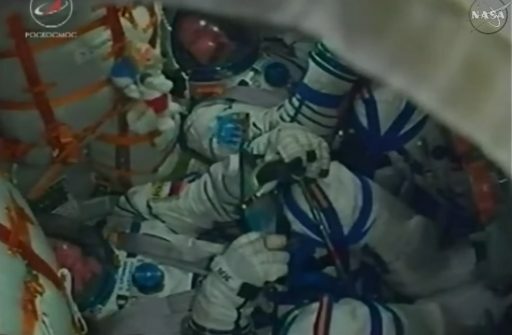 Soyuz pushed through the speed of sound and passed the area of Maximum Dynamic Aerodynamic Pressure 50 seconds after lifting off when crossing an altitude of 11 Kilometers. Burning 1,600 Kilograms of propellant per second, Soyuz quickly lost weight and G forces starting building up to a maximum of 4Gs as the boosters continued to fire at full throttle while the vehicle weighed less than half of what it did at liftoff when the boosters reached the point of shutdown. The SAS Launch Escape Tower fired its jettison motors at T+1 minute and 54 seconds and was quickly followed by the shutdown and separation of the four strap-on boosters at the 118-second mark of the flight after they helped push the Soyuz to an altitude of 50 Kilometers and a speed of over 1.5 Kilometers per second. Being jettisoned outward and away from the still-firing core stage, the four disposable boosters created a brief display of what is known as the Korolev Cross. With the strap-ons headed toward an impact 350 Kilometers from the launch pad, Soyuz continued firing toward orbit on its Block A core stage alone, generating a vacuum thrust in excess of 100 metric-ton-force as it escaped the dense layers of Earth’s atmosphere. When passing an altitude of 85 Kilometers two minutes and 37 seconds after taking flight, Soyuz split open and separated the protective launch shroud as aerodynamic forces were no-longer a danger to the spacecraft structure. The Block A core stage handed off to the Block I third stage four minutes and 47 seconds into the flight with the crew members catapulting forward in their seats as the core cut out and being pushed back again as the RD-0110 upper stage engine lit up on its four-minute burn, separating from the spent core moments after ignition. 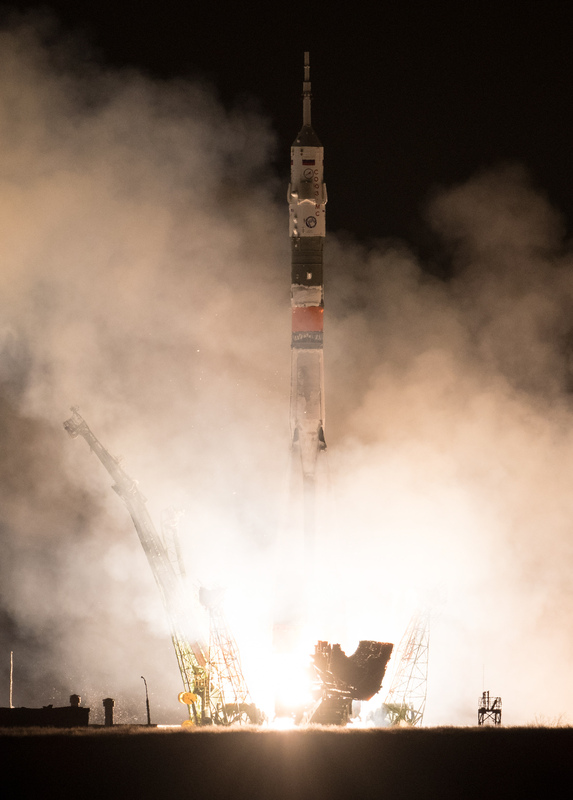 Departing the stack, the 27.8-meter long Block A helped lift Soyuz to an altitude of nearly 160 Kilometers and a speed of 3.8 Kilometers per second. It was up to the 30,400-Kilogram-force Block I third stage to accelerate Soyuz by another four Kilometers per second to achieve orbital velocity. Calls from the Launch Bunker indicated the upper stage was performing admirably and the three crew members found the time to wave to the cameras mounted in the Entry Module. All three crewmen aboard the ascending spacecraft were familiar with what was next – transitioning from the acceleration of rocket power into microgravity in a matter of split seconds. Shutdown of the Block I third stage was confirmed eight minutes and 45 seconds after launch and separation of the Soyuz spacecraft occurred just under four seconds later, sending the spacecraft into a series of critical deployments while the spent third stage opened an oxygen valve to move away from the MS-08 vehicle. Mission Controllers in Moscow closely monitored the critical solar array and KURS antenna deployment as well as the pressurization of the Unified Propulsion System as Soyuz prepared to null residual body rates after separation using its DPO thrusters. Oleg Artemyev reported stable onboard pressures, allowing the crew to open their helmets as they headed off on their first lap around the planet – the first of 34 orbits until docking with the Space Station per the well-proven conventional rendezvous method. The crew’s two-day flight plan starts out with a pair of critical orbit-raising maneuvers on their third lap around the planet, aiming to transition the Soyuz from its planned injection orbit of 200 by 242 Kilometers, 51.66 degrees to a mean altitude over 300 Kilometers. Crew sleep begins on the mission’s sixth orbit and Thursday will be a fairly light day for the trio, dedicated to a small orbit adjustment on the 17th lap around Earth and a manual flight control check. 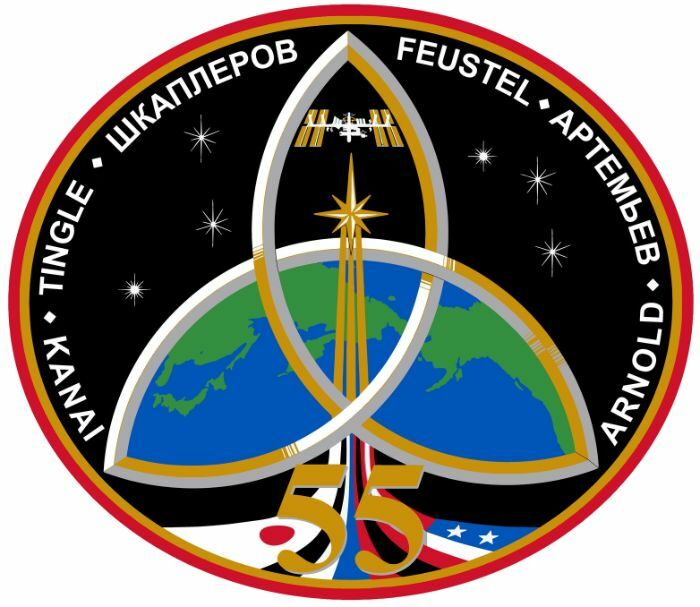 The Automated Rendezvous Sequence kicks off on Friday to continue the climb into the Station’s current 403 by 406-Kilometer orbit, aiming for a fully automated docking to the Poisk module at 19:41 UTC.